Plunging Monthly Rare Earths Price Index - No Sign Of Bottom? The story behind this month’s rare earth metal price index follows on last month’s reading (which held flat). 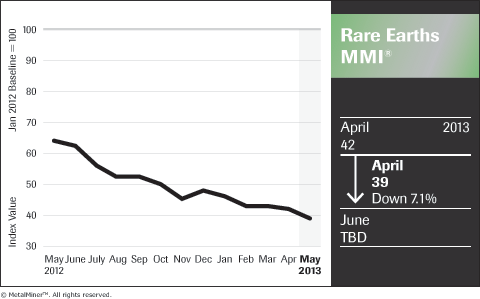 The monthly Rare Earths MMI® dropped three points to 39 in May, a decrease of 7.1 percent from 42 in April. “The headline number dropped on the back of three metals weighted heavily in the monthly MMI series – terbium oxide, europium oxide and dysprosium oxide,” said Lisa Reisman, managing editor of MetalMiner. The elements that effectively increased in price for U.S. buyers (due to USD/yuan exchange rate fluctuation) include yttrium, yttria, terbium metal, samarium oxide, praseodymium oxide, neodymium oxide, neodymium and lanthanum oxide. These price increases indicate to us that some of the policies initiated by the Chinese government may have begun to show price support for certain elements. However, the overall complex, ending up at 39 this month, remains the worst performing of any of the MetalMiner MMI series. A 17.3 percent decline for dysprosium oxide left the price reeling. Following a 17.3 percent decline in price, europium oxide finished the month down as well. After falling 9.0 percent, terbium oxide finished the month pretty spent. After rising the previous month, praseodymium neodymium oxide prices dropped 6.5 percent. Cerium oxide was down 6.4 percent for the month. Prices for neodymium, neodymium oxide, samarium oxide and others above stayed flat in the local Chinese market, but the prices effectively increased slightly in USD.